Living Space: 4305 sq. ft. 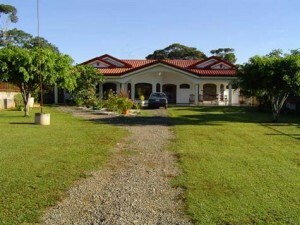 This Beautiful home is located in Palmares de Pérez Zeledón, 10 minutus away from San Isidro Downtown. It has easy access to supermarkets, schools, high schools, and the San Isidro Mall. It is also less than an hour to Dominical and many beautiful beaches. The 400mts2 of construction are all built in cement with ceramic floors, a big corridor, kitchen room with a great ceramic breakfast counter , big living room, terrace, laundry room, warehouse and one room for the cupboard & utilitys. The house has 4 big bedrooms each one with their own closet. The main room has a great closet and an all equiped bathrom with a jacuzzi tub. There are 2 more bathrooms in the house. This house also has an electric alarm, electric gate, 3 car garage, and everything with a luxury finish. It has a big garden with fruit trees, and great security because of the walls and gates.